All Spectrum SMB connections are SMB male. A cable with a SMB female connector is needed to attach to the Spectrum product. 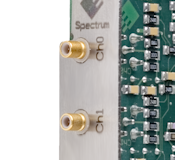 The MMCX connector is the smallest coaxial connector that is available from Spectrum.